It’s about time we stop blaming. It’s about time we stop blaming others and blaming God for what happens in this world. I love a good theological discussion anytime, I also value the time giving pastoral care. However, Jesus is doing neither of these in this passage from the Bible. For Jesus, it’s about time. The question posed by some who come to Jesus is an age old question. It can be put this way, “What did those people do to deserve their suffering”? This time it was men killed while going about their religious duties. Jesus brings up another incident when a tower fell killing people just going about their life. Another time it is two towers in New York brought down by terrorists. Or other more natural disasters a tsunami in the South Pacific, in Japan, drought in East Africa. Again the unnatural–shootings– children in a classroom in Connecticut, worshippers in Oak Creek, or as Chief Flynn said “slow-motion mass murder” in our neighborhoods.Did I miss any? I sure did, awful things are happening all the time. A child with a debilitating and deadly disease, a father in an accident, families torn apart by betrayal and abuse. Intense and unwavering loneliness, addiction, and mental illness. I don’t really need to go on, do I? We all know of the suffering all around us all the time. It would be nice to be able to assign blame, and sometimes we can. We can name a perpetrator. We also can name the forces and influences that allow someone to get a gun, that keep the world from taking the undeniable scientifically climate change and our human influence on climate seriously. There’s plenty of blame to go around. We don’t need to be pointing the finger at God. And that’s about all Jesus says on this matter. I know it may make us feel powerless, but you cannot look at events in the world, in your life and point to them as punishments from God. Suffering is natural consequences of evil, of negligence, of bad decisions or pure chance. We don’t and can’t point fingers and blame God–it’s about time. That is what Jesus is talking about in these verses. Time to repent and timing is everything. And today’s timing is perfect. The movie Lincoln was popular and nominated for awards. This year, is the 150th anniversary of the Emancipation Proclamation, February was Black History month, and March is Women’s history month, and I have been slowly making my way through, reading Uncle Tom’s Cabin. Harriet Beecher Stowe’s 1852 anti-slavery novel which helped fuel the abolitionist, anti-slavery movement before the civil War. Timing is everything. As I said a few moments ago, I haven’t finished that book yet,but just about half way through the story we are introduced to Augustine St.Clare, who buys Tom–the title character Uncle Tom. St. Clare,as he is referred to, is a reluctant slave holder. He sees the evil of the system and how it corrupts both the slave (people of African descent) and the slave holders (including the white society extending beyond those who own slaves). Eventually, St. Clare after making a promise to his dying daughter, decides it’s about time to actually do something. St. Clare begins the process of emancipating (of freeing Tom). St. Clare also decides to ensure that when he dies all of his other slaves are freed and not sold. With this intention in his heart, he leaves his home, only to be mortally wounded as he tries to break up a fight in a bar. Timing is everything and in this case as is true so many times in fiction and in real life, opportunities are missed, tragedies interrupt plans. With his untimely death, all the slaves of the St. Clare household are promptly sold, including Tom whose paperwork had never been completed. It’s about time, Jesus tells us. And, there’s no better time than the present. Right now. Don’t put off till tomorrow, don’t wait, take every chance every opportunity to bear fruit. Now the fruit that we’re talking about isn’t really figs; it’s repentance. The thing about repentance is that it is not just feeling sorry for our sin, for the bad that we’ve done or said. St. Clare felt bad, he despised his participation in the system of subjugating and oppressing others. He hated how slavery tore apart families. He disagreed with how others especially religious preachers justified slavery. Oh, he felt bad, but that’s about all he did. He felt, he didn’t do, he didn’t act. And now for a more contemporary allusion as wise old Yoda says to young Luke “only do or not do, there is no try”. Jesus in this passage calls us to do, to bear the fruit of God’s kingdom. So, you’ve been thinking about forgiving someone, there’s no better day than today, you’ve been praying about giving up the hate you feel toward a brother or sister, now’s not just as good a time as any. Now’s the best time. You been praying to stop smoking, drinking, gambling, stealing, fighting, blaming, complaining, it’s about time! Thinking about putting a little more in the offering plate, calling that person, neighbor, friend up to see how they are doing, or to inviting them to come to worship with you on Sunday morning or Wednesday night, or to come to Community night and sit and listen to someone you’ve never met before, now’s the time. Repentance is about God loving us, loving you so much you don’t have allow fear or failure slow you or stop you. Procrastination is not a spiritual gift. Do it now; it’s about time. Amen. If you are going to play, you’ve got to know the rules. Even with just a few kids on a playground, there are rules. I remember as a kid going over to visit with my dad’s mom, that would make her Grandma Queena Winzer. She lived in small town in Eastern Pennsylvania called Emmaus. Actually that depended upon how old you were. She and the old Pennsylvania Dutch men and women called it Emaus—spelled still spelled with an “E”. Well anyway, I have this memory of going to her little downstairs apartment and playing a board game. It was probably Monopoly or Parchesi or even Scrabble. Myself, my brother and sister were playing the game with her, and well it didn’t end well. It ended when Grandma Queena picked up the board and slammed it down on the table. Although we were old enough to play, I guess we didn’t know the most important rule. The one that says, Grandma Queena always wins. You’ve got to know the rules of the game—especially the game of life, and I’m not talking about the board game. You may have heard the statement, “life is a game”. And sometimes it may feel that way, you know with winners and losers and such. 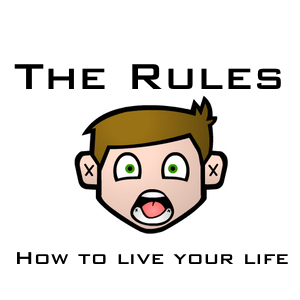 Well, as with all games there are rules to life, so if life is a game then there’s got to be rules. There are rules. The rules of nature everything ages, everything dies. There is the rule of gravity. There are rules within societies, cultures, and communities—you know for example we drive on the right side of the road, posted speed limits, turning our clocks ahead and losing an hour of sleep, etc. and so forth. Reading or hearing our first assigned scripture often leads people to picture God as a heavenly rule maker. As I’ve mentioned before there are some 613 commandments in the Hebrew Bible. The past several weeks our 8:30 Sunday morning Bible Study group has been delving into the commands, the laws, the rules from the Book of Deuteronomy. Anyway, the ones we have this morning is a version of what is known as the 10 Commandments. These are the rules that God gives, through Moses, to a bunch of runaway ex-slaves on their way into freedom of the promised land. Now I’m going to share with you just a few observations that will sound hopefully familiar to that bible study group. First of all, these are not universal rules for everyone. If you notice the first three are about worshipping the One God, the Lord, Yahweh, the Almighty. That makes these 10 Commandments first and foremost religious, that is their origin, and we cannot take God out of the picture. But not everybody worships this God—so therefore the 10 Commandments are not everybody’s rules. However, within this listing there are rules that are shared by just about every other group of civilized people. You see, communities do not thrive if people are just running amok wantonly killing, stealing, and cheating one another. Like I said, you’ve got to have rules. These are the things that guide the common good and build society rather than allow a bunch of individuals running around guided by who’s got the biggest guns, or the biggest bank account—you know might equals right. That’s not good, and God wants to keep us safe from that. God gives to God’s people rules to help us live together. The goal of following the Torah, the commands, the rules of God isn’t to make life a burden, instead it is to help these fledgling people stand up and stand out, to make them not just like everybody else, but to point out their special relationship with God. That’s part of what’s behind that small portion of Psalm 19 – a psalm devoted to the gift of the Torah – Hebrew word for the laws. Now as I said earlier, there are folks who picture God as this heavenly maker of eternal rules. But that’s so limiting of God. At first it may not make sense pairing the reading from Exodus with John’s Gospel story of Jesus overturning the tables. After all, the temple market was a result, was a necessary creation out of God’s command. As that bible study group is learning in our study of Deuteronomy, God decreed that there could only be one place for the people to make their sacrifices—it had to be in the place God chose—and that was in the temple in Jerusalem. This is one of those things that makes the people of God different from all their other neighbors who could set up a shrine or a temple to all sorts of God’s like Zeus, or Aphrodite, or Apollo, or Baal, or Asherah (and do their sacrificing wherever). The Jews by the rules of God’s command could only bring their animal and grain sacrifices to the temple, and that meant even if they lived far, far away. So within the laws of Deuteronomy they were allowed to bring money, now of course the money of Rome promoted Rome and it’s emperor above all else, and that is idolatry, so they had to exchange Roman money for Jewish money to use to purchase the animals or whatever for their sacrifices. That brings us to Jesus flipping out and flipping over the tables. Now before we are call Jesus a rule-breaker (which he was called and which he actually did). He isn’t just overturning a few tablets, I mean tables, he’s overturning the whole game. It is more accurate and more faithful to call him instead a game-changer. You see in Jesus the Christ we aren’t playing by the same rules. The place of sacrifice is with Jesus, it is in our lives, in our hearts, in our actions, in what we do and what we say, in how live each and every day. When it feels like all we are, like all those around us are just pawns in somebody else’s game– God is calling us to gather together for Sabbath worship, for rest , to listen to one another, to hold up and be held up in prayer—to hear God’s compassionate word—you are mine, my child. When it feels like life is a rotten game, that the rules are out of whack and that we’re just losing all the time—when the elderly, the young, the poor, the immigrant, when men, women, and children and issues are just sexualized and are abused—even by our own laws and power players God is calling us to speak and shout, to denounce injustice. To work to bring justice to light in our government, in our marketplace, in our schools. When it feels like we just can’t seem to get it right—when we know the rules we are breaking are hurting—hurting those around us, hurting ourselves, hurting our relationship with God—God calls out to us and says – this is my body given for you. This is for the forgiveness of your sin. No matter what you hear, no matter who says it—life isn’t a game. For Jesus, and for us who follow him, we are freed from that meaninglessness. The life of every man, woman, child sitting in these pews, and out there in their homes and on the streets, every life is sacred—you are a gift to be cherished, to be gift to be set free to be poured out and shared for and with all—God’s love and life with no end. Amen. It doesn’t take a lot to scare some folks. Take me for example; I it seems have always had a healthy dose of fear. As a kid, I think thunder storms were the worst. There was one in particular. We were traveling in our motorhome on vacation and we had stopped at some park or something. I don’t remember all the details, but we were parked very close to a dam. Well that night a doozy of a thunder storm rolled in, and there I was up in this bunk in the motor home. As the lightning strikes and thunder clap shook the motor home, my imagination ran overboard and my fear the dam would break and we would be wiped away by the deluge of water. Yeah, I may not be terribly creative in some respects, but I could always dream up some doomsday scenarios. So buying a bunch of ark, animal, and rainbow baby stuff was never high on my list. I knew the whole story. I knew about God getting so sick and tired of all the evil just about everyone was doing that God opens up the heavenly floodgates to in a sense reverse creation and wipe the slate clean. Except for Noah and his family, and 2 or 7 animals of each kind depending which verses you read in the bible. 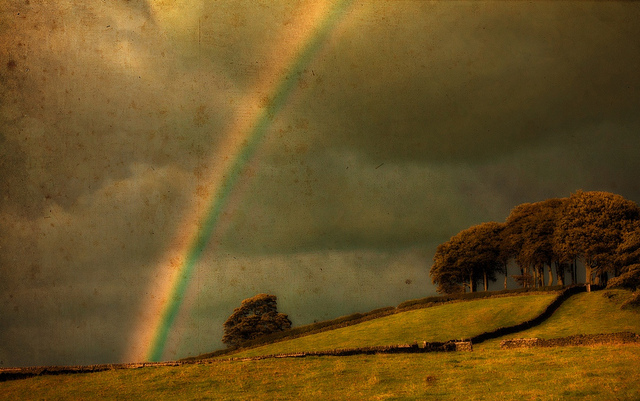 The whole rainbow thing comes after the destruction. As if God looks down and decides enough is enough, one flood is enough and promises to never ever wipe off the face of the earth with a flood, and to make sure there’s no forgetting on anybody’s part, God hangs up the instrument of waging war, the bow in the sky, so now we have the colors of the rainbow as a symbol for love, hope, joy, and welcome for all. Of course, that in itself can be unsettling for some folks. In these days of rampant fear of dire predictions floating from experts, pundits, political action committees, and politicians themselves just about drenching and drowning us in fear. Perhaps that is what is keeping us so paralyzed and polarized on so many things, especially today with the reality of climate change, why some people refuse to acknowledge even with the overwhelming majority of scientist and the data that human activitiy has and is impacting the undeniable reality of global climate change. The water is rising, and again it’s our fault. But fear is a funny thing, and maybe their fear is that if we admit this it may mean that God’s not in control. But God is in control of God’s self. But ever since the beginning God’s not controlled us, we’ve been given the freedom to do great and evil. We could learn a lesson or two from God’s self-control. See that rainbow still appears in the sky, and God does remember the covenant—the promise made and established between God and with every living creature. See God doesn’t limit his or her care and love to just a few folks, to one category of people, people who say the right words and pray the right prayers. All God’s children, Lutherans of even all brands, Roman Catholics, Baptists, non-Christians too, Buddhists, Hindus, and Muslims, non-believers, atheists all God’s children walking on 2 legs, or even on four or 6 or 8 or more, or none at all, the promise we read and heard in our first lesson is for us all. We’re all in the same boat, so to speak. The thing about us, what makes us the church is that we know it. And knowledge is a precious gift and responsibility. We’ve now entered the time of Lent in the church. And you know what Lent has been about ever since it’s beginning about a 1000 years ago? It’s about training us to live faithfully in a fearful world. We spend 40 days in the wilderness of struggle, of sacrifice, of trying and doing stuff that doesn’t really make sense to the rest of the world around to build up, clean up, to focus our faithfulness. These forty days plunges us again and again back into the water, but for us it’s not just rising sea levels but the waters of baptism, immersing us in love and forgiveness so that we can put our fears at bay and free us from their evil power to control us. These days of Lent are the churches days, in that they are your time. So as you head out this morning, out in the lobby at the welcome center is a pile of papers, just take one it’s a list of 40 things, one for each day, these are just ideas and suggestions adapted from a Lutheran mission ministry lead by the Rev. Nadia Bolz-Weber in Denver. Go ahead feel free to take it, and I urge you these 40 some days to really take the plunge, jump in and immerse yourself in all that Lent has for you, in the promises God offers us, don’t be afraid for you to be the person God’s calling, today.